That's one of the headlines on today's edition of Danville's Commercial News (Newspaper). Which resale shop is that? Why would I be mentioning it? Because it is talking about my wife's parents! COVINGTON, Ind. — Duane and Donna Lathrop have turned their hobby into a business with their new venture — Double D Resale — which opens on Black Friday. 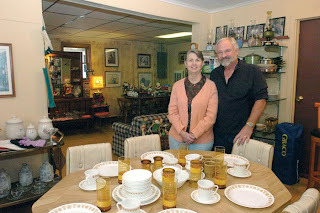 The resale shop is outfitted with furniture, appliances, home collectibles and other “what-nots” the couple has been accumulating through shopping trips to estate sales and auctions the past few months. “Our date night is at the auction,” Duane Lathrop said. I've been on those "auction date nights" and I have to say, they can be fun. That's great....they have a neat little shop ...I will have to take my sister over there while she is in town! I love the title of your blog btw.